Your cultural itinerary includes sights like The Strip and Titanic. 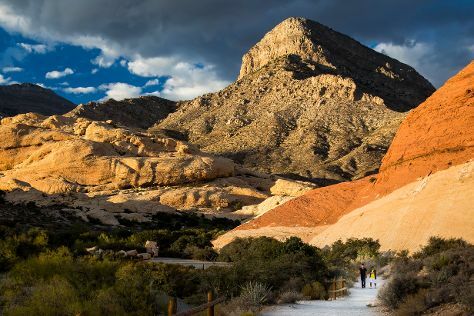 Take a break from the city and head to Red Rock Canyon National Conservation Area and Adrenaline & Extreme Tours. Get out of town with these interesting Las Vegas side-trips: Valley of Fire State Park (in Overton), Clark County Heritage Museum (in Henderson) and Hoover Dam (in Boulder City). Spend the 5th (Fri) riding across the waves with a waterskiing or jet-skiing adventure. The adventure continues: examine the collection at The Mob Museum, take an unforgettable tour with a helicopter tour, admire the natural beauty at Bellagio Conservatory & Botanical Gardens, and ponder the design of Bellagio Fountains. To see maps, more things to do, where to stay, and tourist information, you can read our Las Vegas online route maker . If you are flying in from Philippines, the closest major airports are McCarran International Airport and Laughlin Bullhead International Airport. In March, daily temperatures in Las Vegas can reach 27°C, while at night they dip to 13°C. Wrap up your sightseeing on the 6th (Sat) early enough to travel back home.